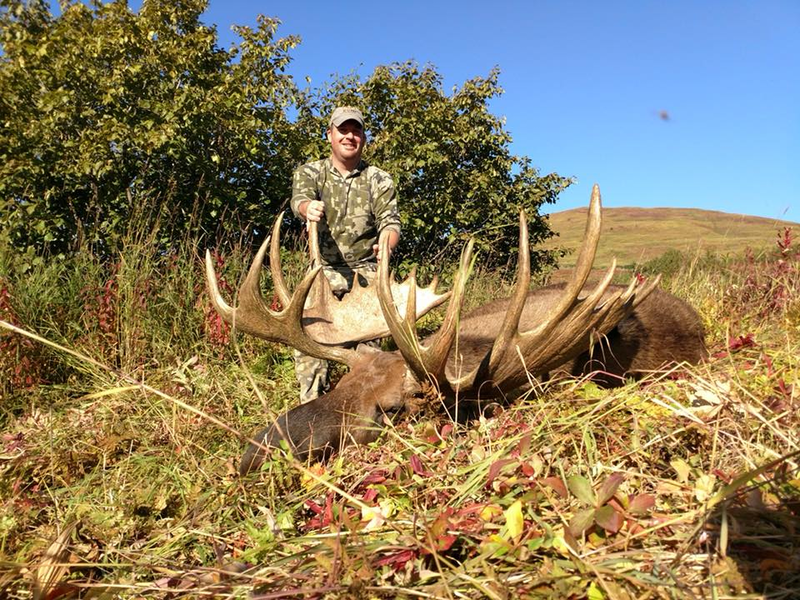 Ben Wiillis and his tremendous 225″ green score bull making it a potential candidate for the all time B&C book. is the world’s largest deer, and one of our most sought-after trophy animals. Our moose areas all produce well, with the average bull taken having between a 55 and 60 inch spread, with some over 60 inches typically taken each year. If you hunt moose out of the lodge, you may opt for day hunts on foot or you may opt to spend a few nights in spike camp. We have some great spike camps several miles from the lodge, which you will access via ATV and hiking. This area is mostly forested, however the spike camps are right at treeline, where glassing is optimal. We also have moose hunting opportunities on our float hunts, and a typical day on a float hunt might involve sitting on stand on a hillside above the river, or in the river corridor itself. In areas where we have good visibility, we will glass for bulls, and in areas where cover is thicker we will call bulls to us. Few hunting experiences can match the thrill of seeing the tops of the willows shake as a large bull comes to the call, thrashing the brush with his antlers with every step. 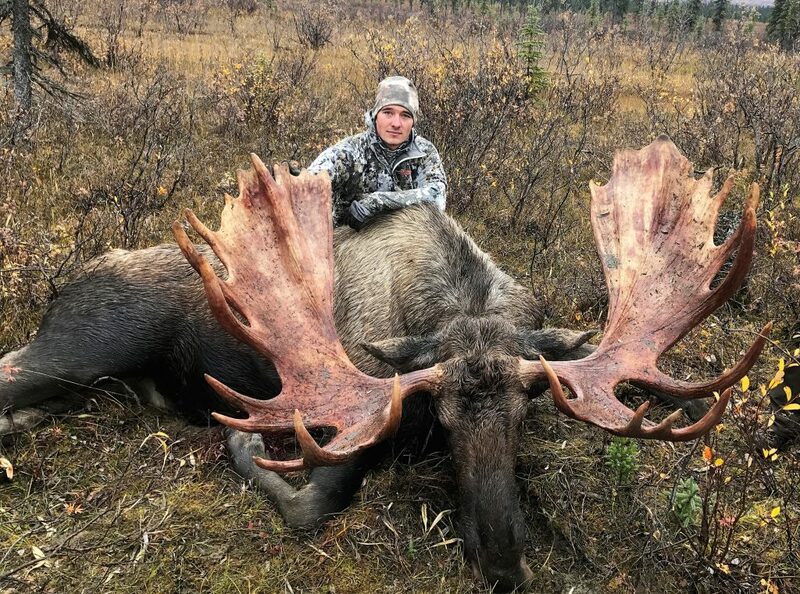 Moose hunters don’t need a lot of specialized gear other than good chest waders, raingear, and possibly a dry bag or two for the float hunts. Expect to have to navigate around boggy areas, and to do some hill climbing in order to glass for bulls. Other than that, moose hunting is not too physically demanding, however you still should be in reasonable physical condition to get the most enjoyment out of your hunt. 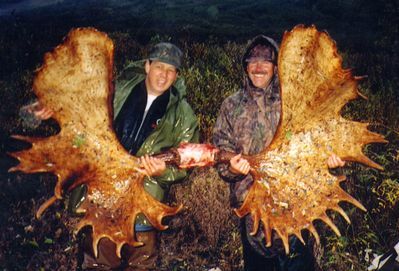 Once your moose is down, we devote our attention to the proper care of your trophy and the hundreds of pounds of delicious moose meat. Some of our hunters opt to leave some meat behind, and we will make sure to distribute it for you if you so choose. Regardless of how much meat you take home, we can refer you to a local processor who will cut, wrap, freeze and ship it to your door. Below, footage of a good bull that came in right below our lodge.